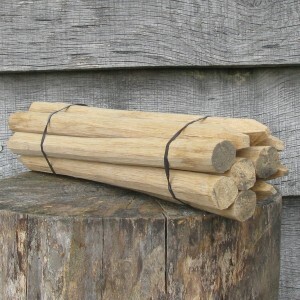 These are out Oak pegs for use in timber framing joints. 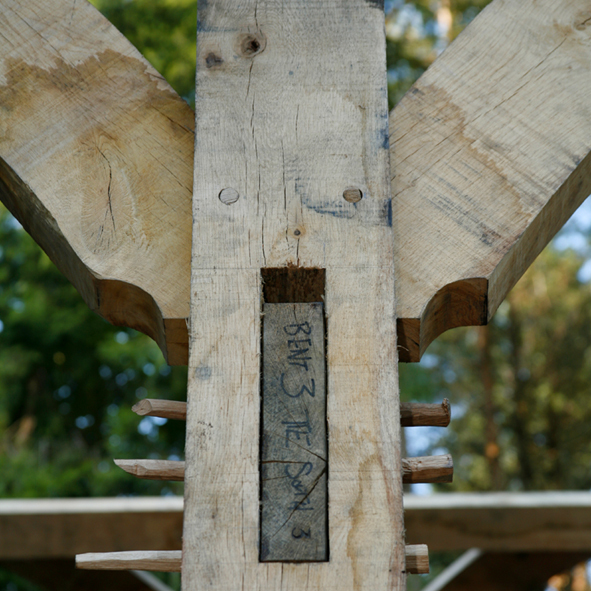 Hand shaped from freshly split Oak rounds on a shave horse (out in the woods no less) by the fair but skilled hands of our coppicers. The pegs have a slight taper at the top and at the point but the central body is 18/9 mm* in the roughly hexagonal shape made by shaving off. The point is made to help locate the peg in the hole so that it can be bashed in (the technical term?) for a tight fit. 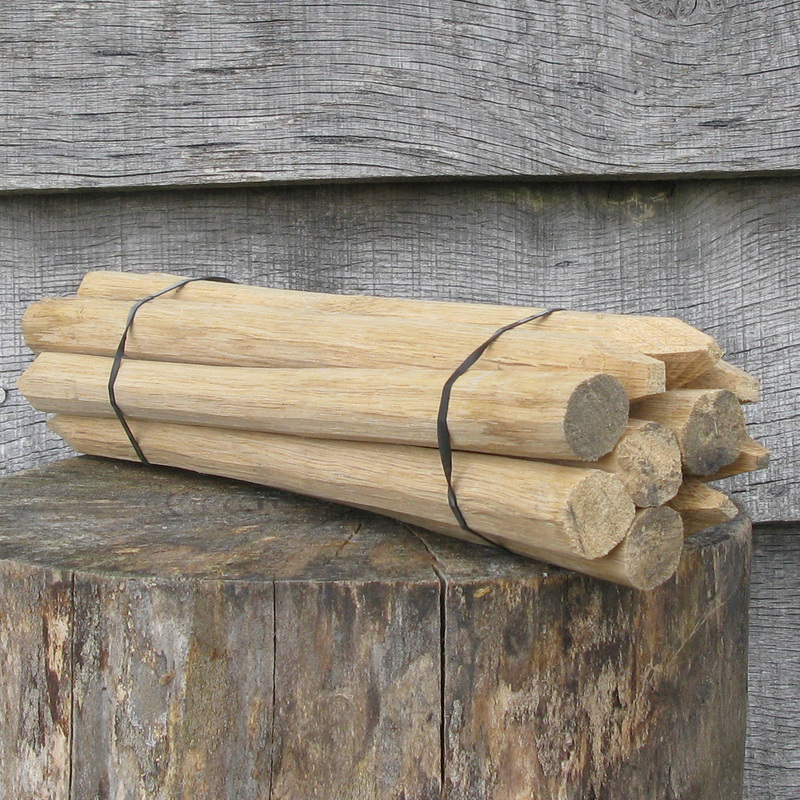 The pegs are generally left sticking out on either side of the joint until the wood has dried out and shrunk down a little, then it can be ‘bashed’ in further if there’s room. 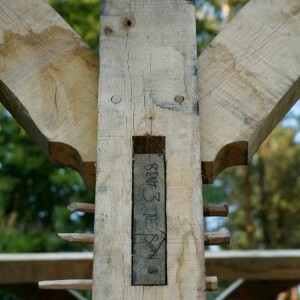 When the timber frame is finished the ends can be taken off cleanly to give a nice round detail on the joint for future generations to marvel over. We keep them in stock in bundles of 10. Pop by and pick them up when you need them or save yourself the time and them alongside your fresh sawn structural Oak cutting list. *18mm (3/4″) are the most common but we can make up thicker or thinner or shorter or longer if you need. 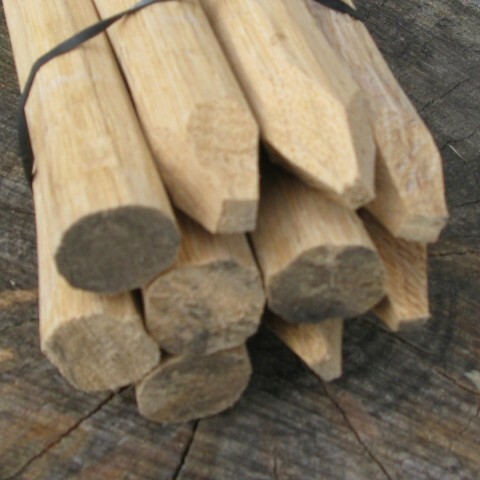 We can also produce proper dowels which are the same green Oak pushed through a dye to get smooth round cyclinders for a slightly different purpose joint. We don’t do an awful lot of them but if you need ’em.. we’ll make ’em!